State Irrigation Minister (Independent charge) and Minister of State for Revenue and Disaster Management Bhabesh Kalita on Thursday said the BJP-led State government has adopted zero tolerance towards corruption and warned the officials of Revenue Department as well as other concerned departments to refrain from corrupt practices. Kalita also stated that if any complaint about corrupt practices is received against any official or staff members of his departments, stern action would be taken immediately. Kalita said this during his visit to Dhubri on Thursday for attending a Youth Sammelan organised by the Sri Ramakrishna Sewa Ashram of Dhubri. 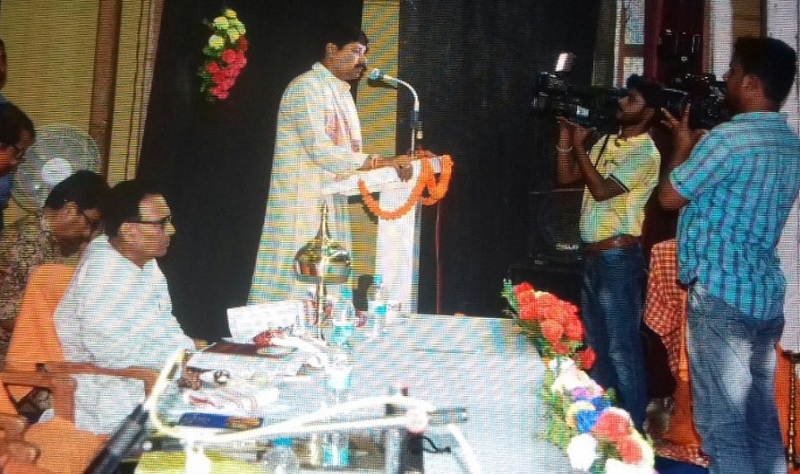 Newly-appointed Minister Kalita was present at the programme organised in the auditorium hall of the District Library here as the Chief Guest. The Sanmmelan was organised with a theme under Monastic direction where a workshop was held on personality development and character building along with 3 Cs (Concentration, Confidence and Character) which was participated by students from different schools and colleges. He also briefed about the different government schemes of employment generation including Swami Vivekananda Jiwan Swablamban Yojna and Kanaklata Rural Livelihood Yojna and urged the unemployed youths of the district to get benefit of the government schemes in large-scale. Earlier on Wednesday, Sri Sri Ram Krishna Sewa Ashram, Dhubri welcomed the Shashwat Bharat Rath Yatra, which began its journey on January 6, 2013 from the sacred soil of Belur Math of West Bengal on the verge of 150th birth anniversary of Swami Vivekananda. The Rath has travelled throughout 22 districts and covered more than 1500 education institutes during the journey since the last five years.